Georgia Page, an Australian rugby player, has set the bar high last week. 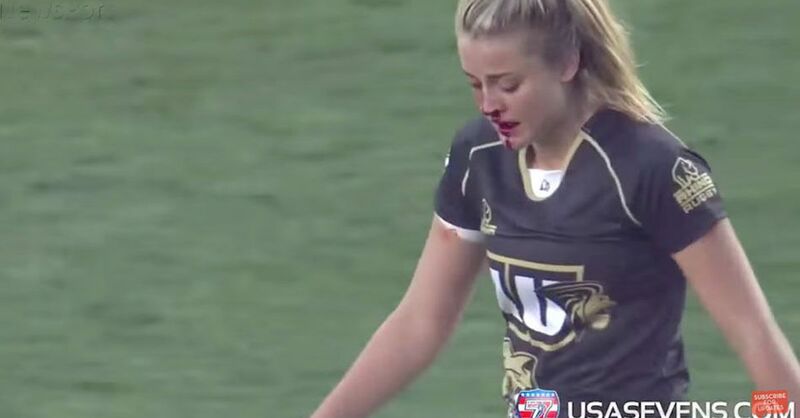 Page – who plays for Lindenwood University in Missouri – became an Internet sensation when she decided to stay on the field and continue playing with a broken nose and a bloody face during a match in the US. The young Aussie’s team was playing a Collegiate Rugby Championship match against Notre Dam on Thursday, when Page broke her nose in the game’s first tackle. She had blood streaming down her face, but decided to continue playing instead of throwing in the towel. Just a few moments after the injury, Page – who was already playing with separated AC joint that day – was back in action and even made one more tackle before the referee spotted her wound and sent her off the field for medical attention. But the unbreakable Aussie was back in the game soon enough, and made an important try saving tackle in the second half of the match. Page’s team won 24-17 and she has been called everything from the ‘Rugby War Goddess’ to the ‘Rugby Hottie’. The Australian rugby player said that she is happy about the media attention, because it shines a spotlight onto her sport. She added that girls need to know they are tough enough to play rugby and her experience will hopefully empower them to do so.